From the tip end of Ile de la Cite, while crossing Pont Neuf, I saw a seemingly endless structure. It looked like a palace, stretching on as far as I could see down the Seine. When we finally came up to the back of the building, I was speechless for a moment. This thing is monumental! The columns, the sculptures, the windows, the architectural details — I didn’t know where to look first. 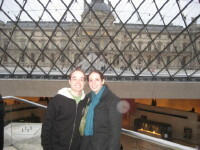 We entered through the archway in from of Pont des Arts, looking back on an amazing view at L’Institute des Arts, another beautiful, domed building, and entered a large courtyard where we were surrounded on all sides by very symmetrical, yet ornate stone walls. 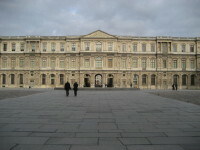 We took a left turn toward the next archway, and emerged into the main courtyard of the Louvre, with I.M. Pei’s glass pyramids. There wasn’t any water in the reflecting pools, but it was still an impressive sight, and the classical palace walls were reflected on the faces of the pyramid. The Louvre then stretches beyond the main courtyard where it even has roads going through its columns — I couldn’t believe the buses fit through them! Sunday, we went in to the museum, and took a whirlwind tour of its top attractions. We saw the Mona Lisa, which really does seem to change depending on which angle you’re looking from, Venus de Milo and other classic pieces of art. One of my favorite exhibits we saw, though, was the Medieval Louvre, where we got to walk through original sections of the fortress that stood on the site. 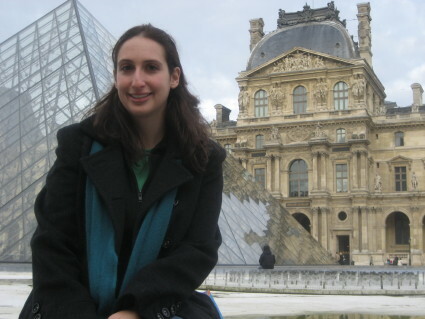 Inside the Louvre, I also saw an amazing elevator/lift — it was open on top, and was a giant round column than pushed out of the ground and everything on it upwards through the center of a spiraling staircase. I’d never seen anything like it. And the pyramid makes the main entrance nice and airy.